20110221 -Up in the am and the visitors from Holland showed up. They showed me what they have been working on and it looks really cool. I packed the car up; Hans rode shotgun, Ivo, Joe, LDJ&G got in the back. We headed north to visit our friends at Spazzmonkey. L and the boys stayed at the Farm and played, GpaW went with us to Spazzmonkey and all talked shop for a couple hours. 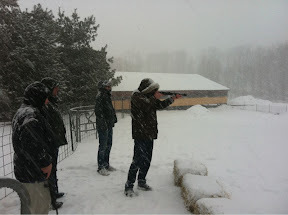 Then back to the farm where we did some gun shooting in the blizzard like conditions. The boys from the Netherlands did pretty good. We had pizza in the farmhouse and then headed home on a very stressful drive down 71. I have never seen it that bad before. It took us 2.5 hours, a stop to clean the windshield off once and Hans had his hand out the window scraping as I continued driving :-o We made it home just in time to set up the garage for a MasterMind Garage meeting. Here Hans and Ivo showed there stuff to the guys and we had good discussion. A long and very productive day.